For the 1985 film Fandango, Alan Silvestri fashioned not only one of his earliest large-scale film scores, but also what remains one of his most dynamic. Like his subsequent score to Back to the Future later that year, the score for Fandango is filled with bristling, yet more serious, action music. 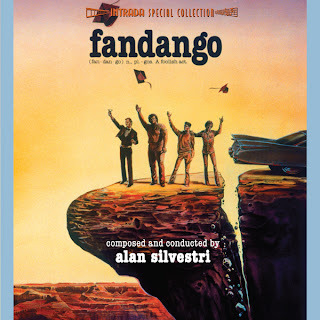 Fandango also contains moments of gorgeous transparent tenderness and haunting beauty, making for a diverse score that remains one of Silvestri's finest efforts. The score as heard in the film clocks in at less than 15 minutes, due to much tampering and replacement of the score with pre-existing music. But even the complete score as presented is judiciously spotted, running slightly over 30 minutes. But a powerful journey those 30 minutes are. For this premiere release, Warner Bros. provided the 2˝ 24-track scoring session master rolls plus virtually all of the studio and engineering session paperwork, allowing for a brand new mix of the entire score in vivid stereo. Every cue Silvestri recorded is included on this CD. The film stars Kevin Costner, Judd Nelson and Sam Robards as three of the five “Groovers,” a group of recent University of Texas grads who set off on one last bender to Mexico before being drafted to serve in Vietnam. Music Composed and Conducted by GEORGE DUNING, STU PHILIPS and More! In 2010, the Film Score Monthly label released the five-CD TV Omnibus. 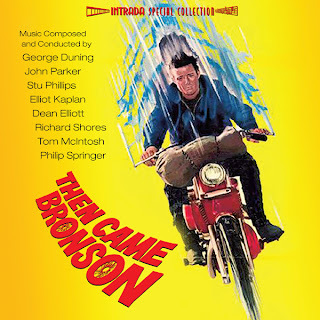 Amongst this collection was music from the TV series pilot Then Came Bronson and two Gil Melle-scored episodes. This all new 2-CD set features more music from the series, including the remaining six episodes scored by George Duning, as well as episodes scored by John Parker, Elliot Kaplan, Stu Philips, Dean Elliot, Tom McIntosh, and Richard Shores. As producer Lukas Kendall writes in his liner notes, "the music carries a certain mood, due to the unique ambition of the series, which I can only characterize as “existential humanist Americana” (or those three words in any order). Here you had a modern-day Hollywood TV show descending on rural America, written, produced and scored within television conventions—but aspiring for something more meaningful than escapism or catching the bad guy." For this release, Intrada had access to the original 1/2" three-track tape, providing exceptional stereo sound. Then Came Bronson (1969–1970) was an ambitious dramatic series from M-G-M Television that aired on NBC for only one season. Michael Parks starred as Jim Bronson, a San Francisco journalist who “drops out” of mainstream society, hitting the road on a motorcycle to discover America—and himself in the process.